The employees of the Criminal Police organized crime department in the summer arrested a young man living in Estonia who sold large amount of different drugs on the darkweb. With the help from the cybercrime unit of the Central Criminal Police, the bitcoins earned from the sale of drugs were also obtained, which, by the present moment, based on the county court order have been confiscated. The information about the amount of bitcoins sized is not available. According to the Prosecutor General Vahur Verte, it is true that identifying the owner of the crypto money and tracking the movement of money is more complicated, but certainly not impossible. How did the police technically size the bitcoins? Were they transfered to state-owned bitcoin wallet? Who paid for the transaction fees? This entry was posted in Digital Currency on February 27, 2018 by user469294. Los Angeles lawyer Justin Sobaje is convinced that Helger Lipmaa, senior researcher of the University of Tartu’s computer science institute, is Satoshi Nakamoto – the creator of bitcoin, and says he has analyses and studies that prove it. Sobaje writes that he is convinced – based on an article in which Nakamoto first describes the nature of bitcoin – that the author or authors of the piece had to have been experts of timestamping technology and hash trees. That is the focus of Helger Lipmaa’s doctoral thesis and scientific papers published in the late 1990s. Lipmaa has cited another two articles the original creator of the bitcoin also cites on his homepage. Conclusion: Lipmaa knows five out of eight articles. Sobaje continues: “Satoshi was an experienced C++ programmer. Lipmaa created timestamping software while working at Cybernetica.” He lists the years Lipmaa spent working for the company until two years before the birth of bitcoin. How was the name Satoshi Nakamoto created? Sobaje has found three Japanese cryptographers mentioned on Lipmaa’s website – Satoshi Obana, Junko Nakajima, Takeshi Okamoto – and concludes that the name of the world’s most wanted man is a combination of the three. Helger Lipmaa, commenting on the matter to Postimees, rejects the idea. “I’m certainly not Satoshi and I don’t understand how he got to my name of all things,” he said, adding that bitcoin’s original creator wasn’t a cryptographer. This could be a potential topic for BSc/MSc thesis, to use open source intelligence to verify if there is some correlation between public activities of Satoshi and Helger/Ahto. This entry was posted in Cryptography, Digital Currency and tagged Ahto Buldas, Helger Lipmaa on February 17, 2018 by user469294. Last spring Pärnu Hospital received information that it is involved in a massive virtual money, or so-called bitcoin mining. 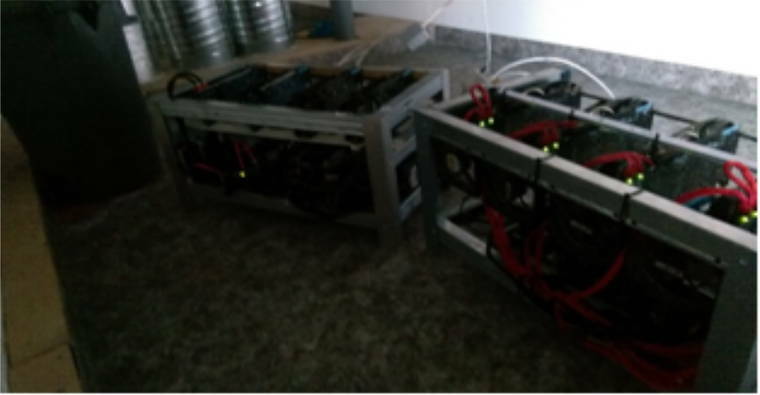 “Arguably, this was the largest bitcoin miner in the area of ​​Pärnu,” added the source. It turned out that bitcoin mining in the hospital was performed for nearly two years. It would be interesting to know how the mining was discovered. There is no place in Bitcoin ecosystem where one could list “largest miners in the area of Pärnu”. The mining was performed by the hospital network administrator and medical technician – they used in total six devices for this purpose. Some of the equipment was placed on the 8th floor in ventilation equipment rooms. The devices had multiple graphics cards, as well as a smaller machine Antminer was running Linux operating system from the SD card. Larger servers using Windows Server 2012 platform also engaged in the extraction of virtual money. The medical technician was let go but the network administrator was given only a warning. “Based on media coverage, it cannot be excluded that the case could be a security incident,” said Toomas Vaks, Deputy Director General of Information System’s Authority. This entry was posted in Digital Currency and tagged Toomas Vaks on February 7, 2017 by user469294. The course will consist of a number of seminars given by invited lecturers. Lecturers will be both from the University and from the industry companies. They will present the research results along with the practice best experiences and examples of the application of the blockchain and smart contract technology. This entry was posted in Digital Currency, Lectures and tagged Alexander Horst Norta, Andreas Sisask, Frederik Payman Milani, Kristo Käärmann, Luciano Garcia Banuelos, Michal Zajac, Thomas Bertani on September 29, 2016 by user469294. Yesterday’s verdict put an end to longstanding doubts whether trades with the cyber money should be treated as economic activity requiring special permit or not – in a landmark stand, Supreme Court declared mediation of Bitcoins an economic activity subject to anti-money-laundering supervision. For ordinary people buying or selling cryptocurrency in occasional transactions for own use, the Supreme Court judgement essentially alters nothing. However, when an individual begins to publicly offer cryptocurrency mediation service, he needs to apply for activity licence and meet the requirements prescribed by Money Laundering and Terrorist Financing Prevention Act. This entry was posted in Court Decisions, Digital Currency, Electronic Payments and tagged Otto de Voogd, Uku Tampere on April 14, 2016 by user469294. According to the Police and Border Guard Board, at least two Estonian companies have become victims of the latest cyber-attack, in which they also received an email demanding Bitcoins. 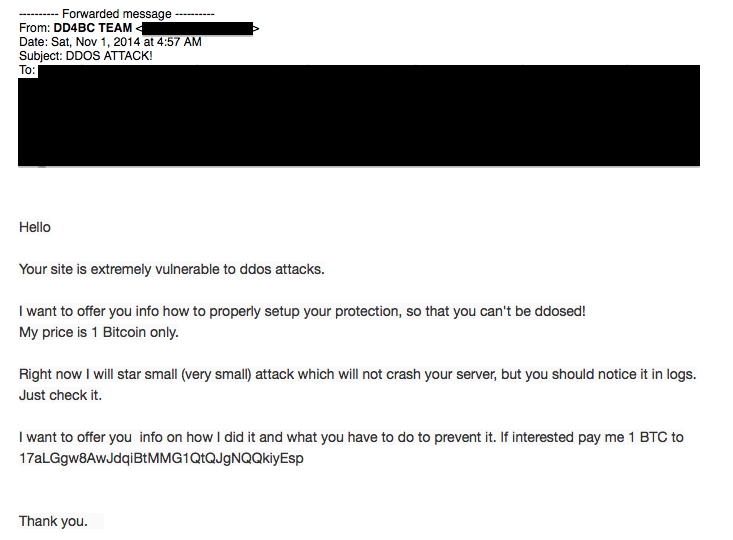 The cyber-criminals threatened in the emails that should they not received Bitcoins, more serious attacks will follow. In both cases, the denial-of-service (DoS) attack was first committed against the official web pages of the respective companies. The businessmen then got an email which specified the account and deadline for transferring the Bitcoins – to avoid a more deadly ambush. According to police representative, the cyber-attack lasted for about an hour. However, the attackers have not carried through their threats, despite the entrepreneurs not giving in to Bitcoin demands. The police have started a criminal investigation. Took a year for Estonian criminals to try out the business plan. Its not yet known who is behind the attack and extortion. Similar cases in Estonia have not been seen before, but the rest of the world is familiar and law enforcement agencies in various countries cooperate to apprehend the criminals. The extortion letters are sent by organized criminals who call themselves “DD4BC”. Searching by “DD4BC” shows that in the last months several organizations in various countries have received Bitcoin extortion letters from group calling themselves DD4BC. However, these might as well be Estonian criminals going under DD4BC handle. This entry was posted in Cybercrime, Denial of Service, Digital Currency on May 14, 2015 by user469294. They warned the mediator that in case anyone operates in said area without licence, this could spell violation as treated by Penal Code come under activity without licence. Following the correspondence, Fiscal Intelligence Unit issued a precept in which they demanded data to determine if the person came under Money Laundering and Terrorist Financing Prevention Act. «He contested the precept and meanwhile our goal was to get him to give the data and say whether he had deals exceeding €1,000. With this we are now in court and we won at first instance,» explained Mr Paul. Representative of mediator Priit Lätt said Fiscal Intelligence Unit had no right to require the data. This entry was posted in Digital Currency, Electronic Payments and tagged Otto de Voogd on December 17, 2014 by user469294.